This is a super easy and fun project! All you need to do is take a Paper lunch bag and fold the bottom of it up, seal the sides ( I use double sided tape) and you have TWO pockets to stuff and fill with goodies for your partner! One of mine is pictured as the Swap picture and you can see that I just added some card stock to the out portions of the white paper lunch bag and decorated it! You must use and paper lunch bag, nothing smaller. Decorate the lunch bag itself for Christmas. You can use Christmas papers, laces, ribbons, washi tape, buttons, etc. Fill the inside with anything you like. Please send something you yourself would love to receive! Don't just fill it up with stickers. Also please be sure to include at least 5 Christmas items inside with anything else you would like to add! 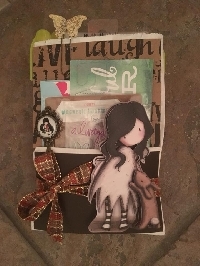 Ideas to fill the pockets: Stickers, 3 D embellishments, jingle bells, hot chocolate, quote cards, Christmas song cards with lyrics, Christmas notecards, Christmas, a pen/pencil, Christmas Paper, angel items, an ornament, etc. Hope all is welI with you. Looking forward to the swap. FYI I sent a message to you today regarding receiving a link to a possible video on making the bag. Just want to make sure I do the lunch bag correctly. A package went out to my partner today. The USPS first-class tracking number is 9500 1102 5872 8344 2483 06. Enjoy!